Spanish language (or in Spanish, “español”) is one of the most important languages in the world when it comes to number of native speakers, and also number of students. It comes in second place with Hindi, after Mandarin Chinese which is the most spoken . The fact that it is so widespread, in spite of being originally spoken in a small area, is due to very interesting historic reasons. Spanish is a Romance language; this means it descends from the language spoken in ancient Rome, Latin. Other Romance, or Latin, languages are French, Portuguese, Romanian and of course Italian. It is also called Castilian, or in Spanish “castellano”. 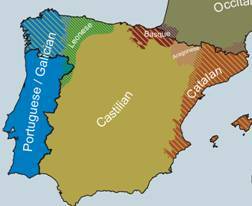 In the Middle Age, Spanish was spoken in the northern parts of the Iberian Peninsula, where many different kingdoms laid. Such kingdoms shared the Christian religion inherited from the Romans. The peninsula was packed with many ethnic groups and languages. In the 8th century, Muslim armies, the Moors, invaded the southern peninsula from North Africa and settled there. 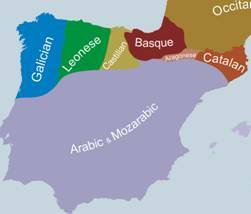 These Christian areas resisted the Moors and started the “Reconquista” which was the re-conquering of the Muslim areas. This period lasted for 800 years, and saw the retreat of the Moors and the expansion of the kingdoms, and also of the language. In the year 1469 the Kingdom of Castile and the Kingdom of Aragon were united by the marriage of Isabella I of Castile and Ferdinand II of Aragon, the beginning of what later would be the Spanish Empire. These united and stronger kingdoms finally expelled the remnants of the Islamic rule from the peninsula in 1492, a key year in the history of human kind, as you might remember, since it was the year of Columbus’ arrival to the New World. The Spanish Empire became the world’s leading power through the 16th century and most of the 17th as well . The Spanish colonization of the New World, although sometimes brutal, helped spread the language to the Spanish colonies in the American continent. 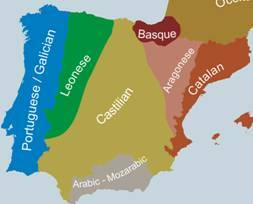 The language also spread within Spain itself to finally become the official language in the present day. Although the other languages of the peninsula are still spoken regionally, everyone in Spain speaks Spanish. The colonies eventually fought for their independence, and won, around the 19th century, but inherited Spanish as their official language too. Nowadays, the language developed as many accents, regional traits, terms and expressions as countries and provinces that speak it. Spanish from Spain is easily recognizable from Mexican Spanish, and this latter is very distinguishable from Argentine Spanish, just as British and American English are different. But the basis and grammar are the same, which makes a text written in Spanish understandable in every part of the Spanish speaking world. A person can actually travel from Mexico to Argentina speaking Spanish and everyone will understand. Recently, by means of immigration, the language has spread to countries where it was not so present a few years ago, such as the rest of Europe and a great part of the United States. 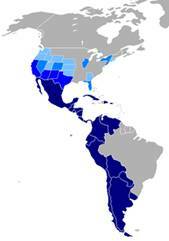 Dark blue: Countries in the American continent where Spanish is the official language and the most spoken, and are considered the core of “Hispanidad” together with Spain. Other shades of blue: Regions with the highest rates of native Spanish speakers.